Indigenous artist, Julie Appo, with some of her textile / wearable art designs which will feature at the Dambali First Nations Fashion Exhibition on 6 October. 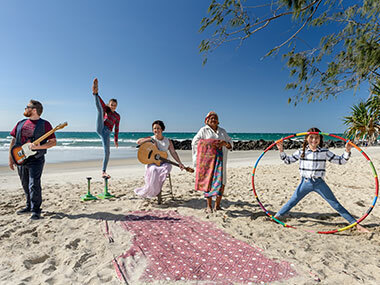 Bundaberg, the gateway to the Southern Great Barrier Reef, will play host to a troupe of local and touring artists, acrobats, writers, filmmakers, choir singers and Indigenous designers from 6 to 15 October for Crush Festival 2017. The 10-day festival will kick off with the Dambali First Nations Fashion Exhibition and Forum on Friday 6 October at the Bundaberg School of Arts. Hosted by local Indigenous artist Julie Appo, this event celebrates the region’s Indigenous fashion, textile design and wearable art creations and is the culmination of two years of work that has seen Julie engage with Indigenous artists learning to use their art for fabric printing. The Gooreng Gooreng word for 'tracks' – 'Dambali' – symbolises progress and moving forward, a theme that will be explored in connection with the global market for Indigenous fashion at the Dambali Fashion Forum. Crush Festival artistic director Shelley Pisani said she is delighted to present Julie Appo's garments, "She has a skill set that as yet has not been fully exposed to her community, let alone the broader arts industry. We are proud to be hosting Dambali as part of this year’s Crush Festival." The Orpheus Singers, conducted by the Gordon Hamilton and featuring works from local Bundaberg composers, will also perform during the Festival. The Carnivale will include concerts, circus performances and other crowd-favourites including a reunion performance from Australian rock legends Moving Pictures, who will be blasting their mega-hit ‘What About Me’ through Bundaberg more than 30 years after it cut to Australian hearts in the country’s pubs and clubs during the 1980s. Locals are also invited to lend their lungs to a few more popular pub ballads with the Crush Carnivale’s Pub Rock Choir on the day. Led by passionate choir masters, with song choices driven by popular demand, more than 40 choir singers will belt out everything from The Beatles’ ‘Hey Jude’ to Pharrell Williams’ ‘Happy’, beers in hand. Adding to the carnival atmosphere, in a regional special, young Bundaberg locals will join Circa Zoo, the youth ensemble of Circa, Australia’s most innovative circus, for a farm-themed spectacle of tumbling, hoops, silks and a triple trapeze following a year-long training program. Crush Carnivale audiences can also look forward to the world-renowned Circa performing 31 Acts in 30 Minutes. Making way for four multi-talented adult Circa performers, this event is perfect for those short on time and big on spectacle. A blur of bending, flying, juggling and balancing, the show has bamboozled audiences around the world from Brighton, England to Vancouver, Canada. For a change of pace over the weekend, some of Australia’s most-loved authors and innovative storytellers will take over CQ University on Saturday 7 and Sunday 8 October for WriteFest. Avid readers and aspiring writers are invited to partake in WriteFest’s thought-provoking presentations, literary entertainment, networking events and skills-development workshops, from songwriting and characterisation to transmedia storytelling. Bookworms are advised to keep one eye off the page for a series of fringe events throughout Crush Festival too, such as the Bundaberg Regional Library’s Author Talk and the Text As Art installation. 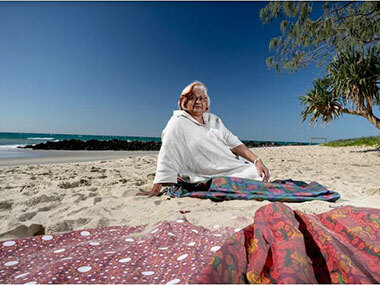 Another exhibition to keep an eye out for is the Stockland Bundaberg Recycled Sculpture Project at Stockland Bundaberg. Raising awareness of the environment and the impact we have through waste, masterpieces made of rubbish will be on display throughout the festival. Beyond the spectacular opening weekend, festival-goers will be treated to campground karaoke at Grey Nomads vs The World. The fun light-hearted two-act play is set in a campsite somewhere in Australia in those most coveted social hours of the day... the late afternoon. Exploring the 50s, 60s and 70s in music, audience members will become karaoke hopefuls. Featuring hits from The Rolling Stones, Roy Orbison, Dolly Parton, Buddy Holly and the king Elvis Presley, this light-hearted romp shall delight anyone who has music in their heart and has ever taken the road less travelled. There will also be the chance to enjoy a lively night of art, history, innovation, music, markets and gelato in Midweek Crush on Wednesday 11 October and to get a sneak peek of some of the region’s most talented artists’ studios in the bespoke Childers and Bundaberg Studio Tours on Thursday 12 and Friday 13 October. The final weekend of Crush Festival 2017 will be jam-packed with a diverse range of events, with something on offer for the whole family. David Stratton’s Travelling Film Festival (13 - 15 October) will return to Bundaberg for its 17 the year to showcase Australian and international features and shorts at Moncrieff Entertainment Centre while on Saturday 14 October The Spirit of Bundaberg, which was named ‘world’s best distillery event’ last year, will treat punters to rum-inspired local music, and rum-fuelled food and cocktails at the iconic Bundaberg Rum Distillery. Moving from visual and taste sensations to tactile explorations, the creative and colourful Kids Crush Day 2017 will present a family-friendly festival of making, creativity and resourcefulness, combining Science, Technology, Engineering, Art and Maths (STEAM) in a range of experiences and hands-on activities for parents and children on Saturday 14 October at Community Lifestyle Support in Kalkie. After 10 days of unique arts and culture events, Crush Festival 2017 will draw to a close on Sunday 16 October with the laidback Sandsculptures and Beach BBQ event at Elliott Heads. This year’s event will feature a temporary labyrinth installation by local artist, Ramona Lane. The Treasures from the Sea Labyrinth will be created on the sand with the public invited to walk the labyrinth and to help create the final design by placing decorations of driftwood, shells and treasures of the sea on it. An opportunity to create and reflect with family and friends in a beautiful space, it’s a fitting end to Crush Festival 2017.